I know it has been a long time since I have posted. Writing has not been easy this past year and I am hoping to ease back into it. I would also encourage you to check out my About and Consulting pages as I have made some updates. My plan is to do more regular posting! The photo below appeared on a friend's Facebook page. I liked it but thought it could use a little refining. One thing I have learned, particularly over the last year, is that life rules are complicated and paradoxical. No money alone cannot buy happiness but the lack of it, the scarcity of it, can be destructive. A long term relationship is not everything and a good one is a very good thing. All of these needed a bit more, more nuance. So here is my version and I am sure it may change again. My re-writing comes from some very hard lessons and some incredibly beautiful and joyful ones. 1) Make enough money that you can thrive. 2) If you choose to have a partner, know yourself, make sure that partner is your best friend and your lover. Make sure they love you for who you are that you can love them that way in return. Finally find a person who will stick by you year after year and keep laughing. If you do not find this person, that is ok because you are enough. Never settle - it will only make both of you miserable. 3) Collect wonderful memories and some painful ones. The painful ones will remind you of the hard lessons you have learned along the way. 4) Respect yourself and embrace the recognition that comes from colleagues, friends, family and strangers. Be the best you that you can be. 5) Make your parents proud of who you are by being your best self, and as Richard Bach says "sharing respect and joy in one another's lives." If your family of origin cannot do that, then create a family of choice that puts respect and joy at the center. Forgive your parents knowing that most likely they did the best they could. 6) Get as much learning, knowledge and wisdom as you can - there is always more to know. 7) Pursue a career that utilizes your best skills, never accept work that compromises your ethics and integrity, get out of toxic work environments even if they share your commitment to social justice (justice begins at home); never accept being paid less than you are worth (volunteer your time to those organizations - jobs are meant to pay you so you can accomplish #1), Know that you are called unto life not just a job. 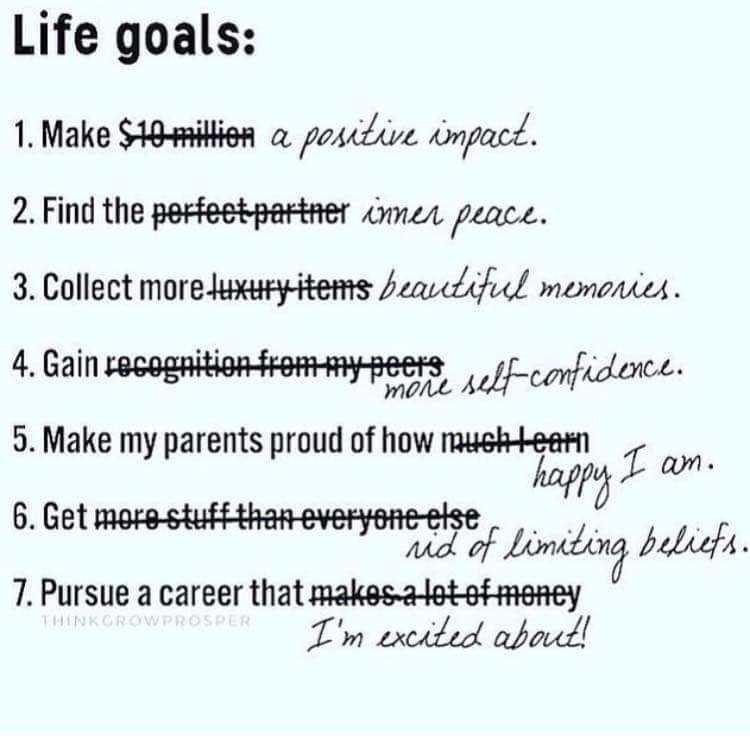 So what would be your Life Goals?